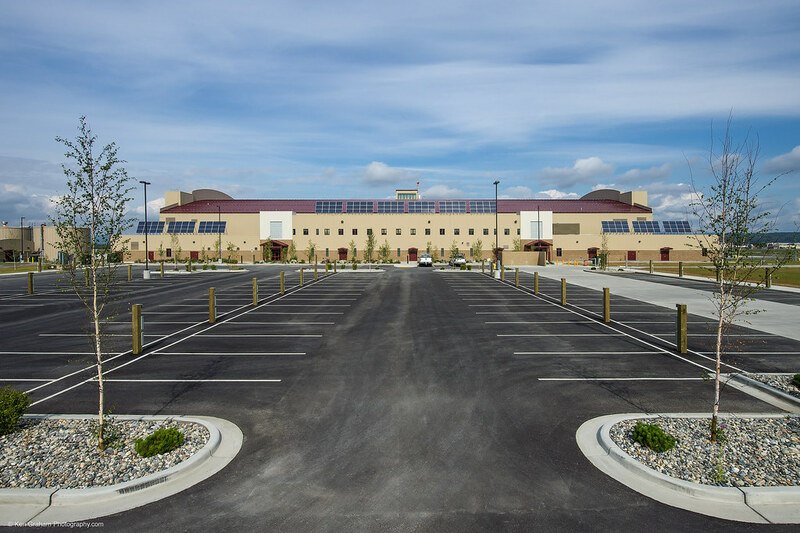 The 348A hangar, apron, and associated site facilities was designed and built as a portion of the infrastructure needed to support the Army’s aviation task force at Fort Wainwright. The site for the 348A facility alone encompassed over 24 acres, bounded to the north by Taxiway 17 and to the south by Montgomery Road. The primary goal of the site layout and grading for this relatively flat site was to match the existing taxiway, yet maintain positive drainage on the nearly 14 acre concrete apron without exceeding UFC specified grades for aprons (or changes in grade) that put excessive stress on the helicopters landing gear. In addition to the 22 helicopter apron, the site layout and grading also incorporated the hangar building, wash rack, 155 car parking lot, a pump house and fire protection water distribution system, and all associated site features. Some of these additional site features included vehicular and pedestrian circulation (while still maintaining adequate AT/FP requirements), apron markings for parking stalls and taxilanes, re-circulated and heated 16-inch-diameter HDPE fire protection pipeline, security fencing, over-excavation and dynamic compaction of the hangar foundation, and drainage ditches. 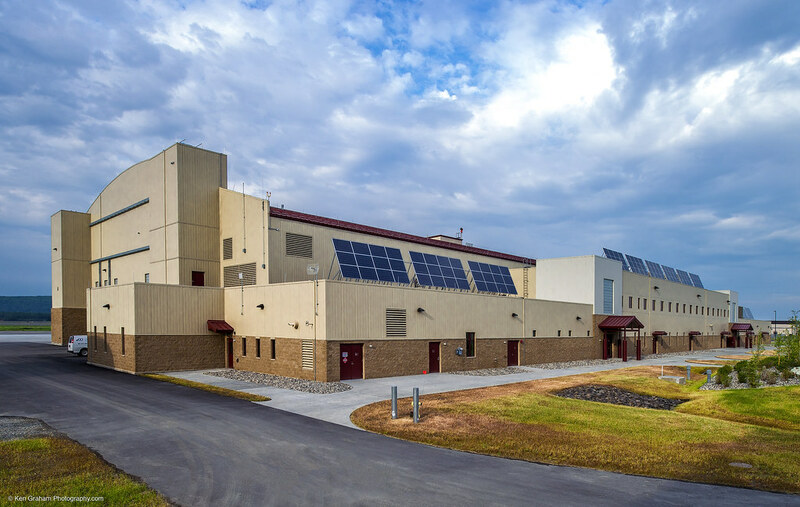 PDC was the Civil Designer of Record, responsible for the site layout (including addressing anti-terrorism/force protection requirements), grading, storm water management, utilities, fire protection piping to multiple hangars, and apron striping and marking. The project required extensive coordination with Doyon’s utility upgrades, both in terms of working with the existing utilities on-site and installing new utilities for Doyon, such as the fire hydrant line. The hangar’s water, sewer, steam and condensate were designed to integrate with the existing Doyon utilities.